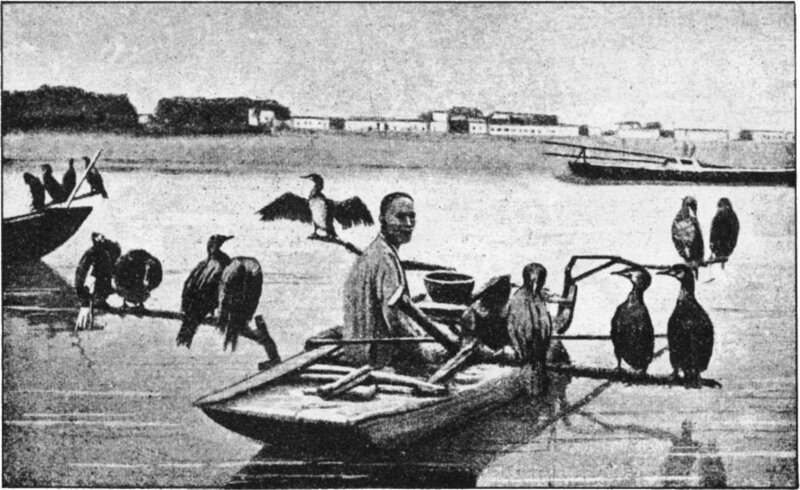 Existing nearly 300 years before the Magna Carta was issued, cormorant fishing is a traditional fishing method historically employed by Chinese and Japanese people. Historically, cormorant fishing has taken place in Japan and China since about 960 AD. It is described as a method used by the ancient Japanese in the Book of Sui, the official history of the Sui Dynasty of China, completed in 636 AD. This technique has also been used in other countries but is currently under threat in China. To control the birds, the fishermen tie a snare near the base of the bird’s throat. This prevents the birds from swallowing larger fish, which are held in their throat, but the birds can swallow smaller fish. When a cormorant has caught a fish in its throat, the fisherman brings the bird back to the boat and has the bird spit the fish up. Though cormorant fishing once was a successful industry, its primary use today is to serve the tourism industry. To catch fish, the fishermen tie a snare around the bird’s throat so that it cannot swallow large fish. Rather, it holds the fish in its throat and coughs it up when the fisherman brings the bird back to the boat.